Things are looking so bad for Democrats in Tuesday's special election for the Senate seat vacated by Ted Kennedy that MSNBC's Chris Matthews is concerned there aren't any left-leaning votes for his Party to buy. "You know in the old days...if the Democrats faced this kind of a disaster in the works, you`d go back to your ones, the people you were sure are going to vote Democrat, and you`d make sure they got to the polling place," Matthews told NBC's Chuck Todd on Friday's "Hardball." 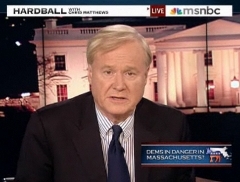 CHRIS MATTHEWS, HOST: What struck me are a couple of numbers in the Suffolk poll. First of all the Suffolk University poll has it 50-46 for Brown, pollster.com`s trendlines have crossed on Brown`s favor. I talked about it the other day and people questioned that but it looked like it was headed that way, clearly it`s headed now towards Brown`s direction. Two national implications I wanted you to talk to, one is the independents. Based on the Suffolk poll I read late last night it shows independents breaking heavily for the Republican candidate. MATTHEWS: That seems to be a national situation you`re facing now if you`re Democrat. TODD: We`ve seen this in our own national polling, that`s where the president`s approval rating has eroded the most. We saw it in Virginia; we saw it in New Jersey. There`s plenty of anecdotal evidence it`s the middle, it`s independents that are moving away from Democrats right now and frankly moving away from all incumbents. And again Brown`s been able to grab the outsider mantle and we`ve seen this pattern, the outsider candidates have had a better shot in all of these races that we`ve seen and there`s not been a lot but boy to be anti- Washington right now, to be anti-incumbent is a big deal even in supposed deep blue Massachusetts. And I thought, Chris, the national implications for this, I mean, on the last day of the president`s first year in office to lose your 60th senate seat and it`s Ted Kennedy`s senate seat, the health care senate seat. You don`t want to say it`s crippling to the president`s agenda but it certainly hobbles him and boy does it make him look politically a lot weaker on the first day of his second year than he was any day in his first year in office. MATTHEWS: Ok. A lot of other people out there where that would take (INAUDIBLE) word in Pennsylvania, Russ Feingold, Patty Murray, the whole bunch of them have imbibed him. But here`s the question. If the polling`s right up there and you and I are students of this -- if the polling`s right and 99 percent of people have made up their minds in the Commonwealth of Massachusetts, isn`t the president risking an awful lot going up there and asking people who`ve already made up their minds to change their minds just because he shows up on Sunday? TODD: Well, this is about energizing and getting Democrats out. He`s not talking to swing voters on Sunday. This is about talking to voters who approve of him, who are favorable to him. MATTHEWS: Has she campaigned at all. Has she gone out and walked up and down the triple-deckers? Has she gone door-to-door? TODD: In the last two weeks, yes, but she took off about a month, and look, everybody did it. People in Washington, I mean this is, everybody`s going to blame Coakley that she wanted to coast, and everybody was whispering in her ear once you won the primary you`re the virtual senator, you`re the senator-elect, you might as well start thinking that way. And you know the Republicans didn`t and this guy Brown, he`s not a neophyte. This has been a candidate the Republicans have identified for the last few years in Massachusetts, wanted to get him to run for Congress, believed he was a rising star so when the spotlight got turned on, he performed and she`s turned out, you know, across between sort of a technocrat a little bit, I think doesn`t seem to have this automatic warmth, hasn`t been able to connect and now they`re grasping for messages. Today it`s all about Wall Street and the bank fee, just shows you they never had a consistent message about why not Brown. Elections are about choices. They`re not always just a referendum on one party or the other. CHRIS MATTHEWS, HOST: You know in the old days, maybe I shouldn`t be harkening back to the old days, if the Democrats faced this kind of a disaster in the works, you`d go back to your ones, the people you were sure are going to vote Democrat, and you`d make sure they got to the polling place, you`d get them lunch, you`d get them a car. MATTHEWS: You`d make sure they got there and in some cases you`d be buying people to get them, not officially buying them, but getting them there as block secretaries, as block captains, you`d be getting them there with street money, legitimate but it`s a little bit old school. MATTHEWS: But I hear talking to somebody today there aren`t people up there in Massachusetts like that anymore. There aren`t those automatic Democrat votes, those ones anymore. You can`t count on anybody. You go to the regulars and they say well, I`m ticked off about taxes, too. Is that right? TODD: No. It is and it doesn`t help that Coakley didn`t have a great relationship with sort of the Democratic hierarchy there in Massachusetts, so all of a sudden she`s in panic mode and everybody`s going uh-huh, but we`ll see. You`re right, Chris, it isn`t the old machine that`s up there. MATTHEWS: Well the street corner guys are probably getting called on a bit too late perhaps. We`ll see. It could be very close. Thank you, Chuck Todd. It`s a great to have a pro. Yes, it sure is too bad there aren't any votes for Democrats to buy this time. My heart bleeds -- how about yours?